Today, we’ll review the Concord 8-Quart Pressure Cooker, Do you appreciate a home cooked meal, but don’t always have the time or energy to get it done? A pressure cooker is an efficient kitchen tool that will help you cook food in a shorter amount of time than other cooking methods. In fact, it could reduce your cooking time by 70 percent. By boiling water or broth inside the closed pressure cooker, steam and internal pressure raises the temperature to cook food rapidly and efficiently. Whether you are preparing an entire chicken or some split pea soup, a pressure cooker will help you to quickly have a delicious meal on the table. There are many types of pressure cookers on the market today, but let’s compare the strengths and weaknesses of the Concord 8-Quart Pressure Cooker to help you decide if it is the right product for your pressure cooking needs. 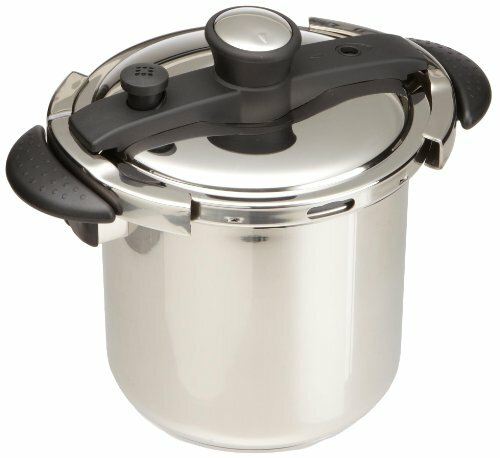 The Concord 8-Quart Pressure Cooker features a fully polished, stainless steel, metal pan body with bake-lite handles. Even heat distribution is made possible with the tri-layer bottom, which is 18/10 stainless steel. Weighing in at 12 pounds, this pressure cooker can be described as sturdy and heavy-weight. The pot dimensions are 9 inches high by 9.5 inches wide. Furthermore, the lid has a high density silicon sealant ring. One of the major benefits of this pressure cooker is it can be used on gas, electric, or fire heating sources. The strengths and weaknesses of the Concord 8-Quart Pressure Cooker are analyzed below. The Concord 8-Quart Pressure Cooker has a simple and solid design that will go well with any kitchen décor. Its uncomplicated bowl and lid are made from high quality 18/10 stainless steel. Additionally, you can leave the cooker out on the counter or store it out of sight because it isn’t too big and bulky. The cooker is basically just the pot and lid so you should not have to go searching for any small parts. If you do need to replace the sealant ring, it should be easy to find. One more advantage of the Concord 8-Quart Pressure Cooker is that it is UL safety ensured. What does this mean? It is a certification process that makes sure the product meets certain safety requirements focused on electrical safety, fire risks, and any other potential product hazards. Pressure cookers of the past didn’t have the safety venting and valve stem that protects from overpressure. If you enjoy camping or cooking over an open flame, the Concord 8-Quart Pressure Cooker is a helpful appliance. It obviously works as a pressure cooker, but it can also be used as a standard cooking pot if you take off the pressure cooking lid. You can use it on a ceramic, gas, halogen or electric cook top. Moreover, it can also be used on a camping stove or barbeque. The Concord 8-Quart Pressure Cooker will provide you with a delicious home cooked meal wherever you are. Durability and longevity are major benefits of a stovetop pressure cooker. Unlike its electric counterpart, stove top pressure cookers could be an appliance that is passed down through generations. One disadvantage is that there is no precise way to know the PSI, but most stovetop pressure cookers operate within 11.6-15psi. There are safety valves on the pressure cooker that are set for an unknown temperature, which cannot be surpassed. Therefore, it can only cook under the pressure set by the manufacturer. Another disadvantage is that there is not an integrated timer. You will need to set a timer to keep track of cooking time while the pot is at the appropriate pressure. Unlike most electric pressure cookers, there is not a way to delay the start of the pressure cooker. A delayed start is helpful for cooking meals that do not contain dairy, meat or other ingredients that need refrigeration. Some pressure cookers are able to work as a slow cooker, rice cooker, steamer, yogurt maker, and more. The Concord 8-Quart Pressure Cooker has one function and that is to work as a pressure cooker. This isn’t really a disadvantage if you are in the market for just a pressure cooker. If you are looking for a pressure cooker with lots of bells and whistles, you might want to try a different product. Similarly, if you are the type of person to set it and forget it, the Concord 8-Quart Pressure Cooker probably won’t work for you. On the other hand, if you are looking for a simple pressure cooker that gets the job done, then the Concord 8-Quart Pressure Cooker might just be what you need. It is a great pressure cooker to use on the stove or on camping trips and will last you for many years.